At Budget Blinds of Enfield, we're your local neighborhood experts that truly understand your needs. We're in your neighborhood, we know the local Enfield weather and community, and we’re backed by the #1 provider of blinds, shades, and drapes in North America. Over 25 years of customer satisfaction gives you peace of mind that only comes with choosing the proven leader. We bring the showroom to you in Enfield. We expertly measure your space, install beautiful window treatments, and back it up with the best warranty in the business so you can sit back and relax in the beautiful, Enfield weather and sunshine. We serve to give you the best in window treatments, so you can rest easy knowing your space will be beautified and optimized with window treatments that fit your individual needs. Our experience in the Window Covering Industry sets us apart from the competition, but our passion for customer satisfaction is what keeps our clients returning for more! Hello, we’re glad you’re here at Budget Blinds of Enfield! If you’ve been thinking of upgrading your home’s décor with stunning, new custom window fashions then you’ve come to the right place. That’s because the expert team here at Budget Blinds of Enfield is backed by America’s #1 provider of custom window fashions. As a locally-based and family-owned business, and proud member of the North Central Connecticut Chamber of Commerce, our highly trained design consultants come to you in the comfort of your own home with our FREE design consultation. We’ll create and design expressive window fashions that compliment your existing interior and furnishings beautifully. From value-priced and versatile blinds, to shades, genuine wooden shutters, and elegant drapery, we’ll transform your home’s décor into something truly special. And to make it both easy and convenient, we handle everything from expert design to precision installation right in your home. So whether you’re near the Connecticut River, Pleasant View Golf Course, or another area of Enfield, let our unique, personalized approach to creating home décor magic elevate your windows and your life. You know your windows have been talking to you and asking for Budget Blinds of Enfield, and you also know we had you at “hello”, so call or click today and schedule your FREE in-home design consultation. Great Job - second time around - twice very happy! From beginning to end of job was very friendly and professional. Thank you! Budget Blinds of Enfield is hiring ~ Join Our Team! We are in search of Design Consultants and Installers ~ Apply Now! Outside window treatment sales to residential and commercial locations. Creatively problem-solve window treatment challenges that incorporate functionality and aesthetics. 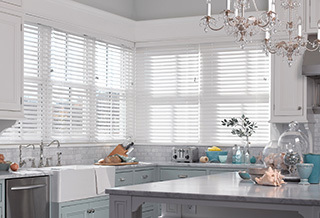 Proficient in window treatment products including blinds, shades, shutters, drapes and smart home automation. Right and Left-Brain abilities include a creative flair for color and décor along with proficiency in math and taking measurements. Accuracy and attention to detail are a must with ability to provide diagrams, photos and detailed installation instructions. A passion to help people improve their space with window treatments and a consultative sales approach. A hunger to succeed and surpass sales goals yet also a customer service-oriented team player. Neat, clean appearance. Understand the importance of getting the job done right and on-time. You enjoy making sales and meeting and exceeding a monthly quota. Commission based compensation with starting expectations at $ 28,000 with the potential to exceed $60,000 per year, based on sales volume. Proficiency in math are a must. Use of a tape measure, laser measuring tool and the ability to understand fractions is required. Highly organized professional individuals that are passionate about sales, creative problem solving, and success driven. Self-motivated customer service-oriented team player. Understand the importance of getting the job done right and on time. Problem solving skills and a can-do attitude. You enjoy making sales and meeting and exceeding a monthly quota. You are a team-player with a can-do attitude and strong work-ethic/ initiative. Although your primary responsibility is outside sales, in a small business, we are all cross-trained to cover for each other when needed in the office/ showroom. Effectively organize, prioritize, pack and install daily customer orders. Properly demonstrate and photograph completed work. Reinforce product warranty and provide customers with company promotional materials. Complete all required reports and installer checklists. Attend daily production meeting and vendor training as needed. Brainstorm installation challenges, both on the job and in reviewing incoming complicated jobs, i.e. shutters, home automation. Complete weekly physical inventory. Put away daily incoming product / pull packing slips. Ask for customer referrals and canvass daily. Ask for customer referrals and canvass daily. M-F 10 am-6 pm, Sat., by Appt.